This is the true story behind what I suspect might be the earliest known photograph of a waterspout or tornado in New Zealand. As I’ve stated many times before, every photo, postcard or piece of paper has a story to tell, however this one really will blow you away. Today’s story has everything – an extreme weather event, a windswept far-flung island, a budding pioneer botanist and a cavalry charge at the Battle of Waterloo. Our story starts on the remote Chatham Islands on November 10th 1912. A local sheep farmer looks across the bay and spies a peculiar funnel-shaped cloud forming at the base of a menacing bank of clouds. This sheep farmer has survived a war, travelled the world and called this far-flung island home for nearly half a century but he has never witnessed anything like this. The water beneath the funnel is whipped into a frenzy and starts reaching up to the heavens, meeting the funnel cloud and forming a violent waterspout. It is followed by a second waterspout, and then unbelievably a third. This is a postcard copy of the photo that sheep-farmer took little over a one hundred years ago. When I bought this example for my collection I had seen a couple of other copies of it on the marketplace so knew that while it wasn’t exceedingly rare it always fetched a high price – and no surprise really as this card is an absolute beauty! It is one of my all time favourites. The back of the image includes a handwritten note from a Chatham Island local. “This is a photo taken of a water spout, it lasted for about 2 hours. We can see where it was from our whare”. Armed only with this postcard I set out to find as much as I possibly could about this extreme weather event and the farmer that took the photo. Both are remarkable stories. The photographer was Chatham Island settler and sheep farmer, Felix Arthur Douglas Cox. This was indeed the first time he had ever seen a waterspout, but he wasn’t a stranger to meteorology. Cox had a remarkable appetite for the natural world and despite having never seen a waterspout before; he knew exactly what it was. He had even been running his own weather station in his backyard, meticulously taking records for years. When he sighted the waterspouts he understood the rarity of the event and did his best to record the experience for the world to see. To put this into context, the earliest known photograph of a tornado in Australia was only taken a year earlier in 1911. 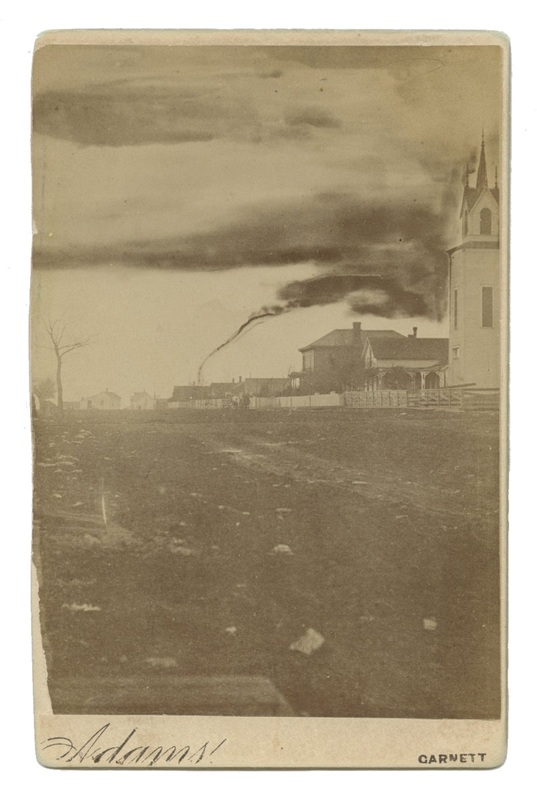 The first photograph ever of a tornado anywhere in the world was taken in 1884. With no other obvious contenders I believe this to be the earliest known photograph of a waterspout or tornado in New Zealand. The fact that it shows three waterspouts makes it especially notable, not just now but also when it was first taken. In fact, his photograph went viral. There was of course no Twitter, Facebook or instagram in 1912 (if there had been then I can only imagine the reaction to the sinking of the Titanic). You had to be much more proactive if you wanted to share your observations with the world – and Cox was exactly that. He sent away a copy of his photograph and eyewitness account and it was published in the April 1913 issue of Symon’s internationally renowned Monthly Meteorological Magazine. His photograph and account then went on to be republished in academic meteorological works such as “The Principles of Aerography” by Alexander McAdie in 1917. The Chatham Islander’s sighting had become famous, and was in the hands of every budding meteorologist in the world. Here is his account of the sighting as published in “The Principles of Aerography”. The description is remarkable and it is easy to see the value to meteorologists – Cox had not only taken a photograph of an extremely rare event but he also provided an excellent account of the entire episode. I was intrigued – who is this Chatham Islander that was so well-educated and had the initiative to share his observation with the world? The short answer is that there was a remarkable man behind the camera that took this remarkable photo. Felix Arthur Douglas Cox was born on 9th May 1837. He attended boarding school at Rugby, only a couple of decades after William Webb-Ellis is alleged to have infamously picked up a ball and run with it. At the age of twenty, Cox followed a proud family military tradition and joined the 17th Bengal Native Infantry in India. His father Samuel Cox had been a cavalry officer in the 1st Life Guards at Waterloo. You can see his name here – listed as being severely wounded. The Life Guards were part of the Household Brigade, which at a critical point of the battle were ordered to charge. The world seems small and history seems short when you know that a son of one of those charging cavalrymen would grow up to take a photo of three waterspouts in the Chatham Islands. So young Arthur had the honour of a strong family military history riding on him when he joined the 17th Bengal Native Infantry in 1857. He didn’t have to wait long to prove himself – that same year the Indian Mutiny broke out. Cox transferred to a British Regiment, the 34th Foot (Cumberland) and was with the force that relieved the besieged city of Lucknow. He was awarded the Indian Mutiny Medal. After proving his mettle as a soldier he decided to carve out a new future for himself on the far side of the world. His brother had immigrated to New Zealand and Arthur followed suit. He heard reports of settlers on the distant Chatham Islands making a good living from supplying food for whalers and in the mid-late 1860’s he decided to join them. The Chatham Islands are remote and rugged even by today’s standards, let alone in the 19th century. I don’t know why he chose such a life for himself but he made the most of his new home on the windswept and unexplored island. Cox had an insatiable appetite for the world around him. While starting a sheep farm on one of the most remote islands in the world might be enough of a challenge for your average settler he didn’t stop there. Instead he set out to meticulously catalogue everything he encountered. He became an ornithologist, botanist, naturalist, anthropologist and meteorologist. I’m not kidding – his work in all those fields is still recognised today. His efforts were acknowledged in ‘A Short Account of the Plant-covering of Chatham Island’, which was read before the Philosophical Institute of Canterbury on 6th November, 1901. When he wasn’t cataloguing plants or assisting visiting botanists Cox was often out bird watching. In 1909 his account of Chatham Island bird life was published throughout New Zealand. He reported that sadly many species were on the verge of extinction and in at least once instance he was right – today the Chatham Island bellbird is listed as extinct. Cox made a habit of communicating his findings with the outside world. He regularly corresponded with Julius von Haast, one time even sending him a Leopard Seal skull for the Canterbury Museum. It is incredible that he had any time for sheep farming in-between his botany, bird watching and the running of the home-built weather station that he tended with business partner, brother in-law and lifelong friend, Alexander Shand. Cox rarely left the Chathams, but one such visit in 1910 made headlines throughout New Zealand with the title “Back to Civilisation: After 45 years of exile. Marvels of a fresh age”. “Until last week he never saw a bicycle, an electric tramcar, a taxicab, or even a hansom cab.” The kinematograph entertainment surprised him more than anything else. “he saw amongst the moving pictures representations of scenes in the South African War which gave him a good idea of the changes brought about in regard to modern methods of fighting. He found a great deal of interest in the modern style of uniforms, the accoutrements, and the big gun armaments”. Two years later he took the photograph of the three waterspouts and as with all of his other observations, he humbly shared it with anyone he thought might be interested. But was it really the first photograph of a tornado in New Zealand? Such a claim can’t be made lightly so I’ve checked multiple archives including the Turnbull Library which houses the largest photograph collection in the country. I’ve also run the question past several notable historians, the Met Service and several museum collections – in all instances no one has been able to name an earlier photograph than the one taken by Cox. I’ve also checked with two notable collectors of New Zealand postcards and while both knew of other examples of the 1912 Chatham Islands postcard in my collection neither of them were able to name any other tornado or waterspout photographs from this part of the world. As mentioned before, at the time this was an incredibly rare photograph. The earliest tornado photograph from Australia was only taken one year earlier and Cox’s image was unique enough to even warrant international publication. Unless someone makes a discovery in an attic, shoebox or archive then I suspect this is indeed the earliest example of a photograph of a tornado in New Zealand. With a couple of provisos of course – that is as long as you classify a waterspout as a tornado (it is debatable, as not all waterspouts are tornadic) and as long as all my readers know that the Chatham Islands are some distance from the mainland. In any event, Cox’s photograph is an absolute stunner and while largely forgotten today it serves as a lasting testament to a bloody impressive settler that displayed an admirable fascination with the island he called home. He does have one other legacy besides the photograph – on the Chatham Islands there is a shrub that bears his name. One of the visiting botanists decided that Cox’s enthusiastic efforts in the field should be immortalized. That description seems equally appropriate for both the shrubbery and the man it was named for. He was certainly well designed to withstand the weather – not to mention photograph it. Awesome post – had a great twist. Hehe bring out the puns! That is a seriously cool picture – I tried to imagine it when you mentioned you were looking into it, but the triple-spout imagery is simply extraordinary. Even if somebody had taken a pic of a waterspoiut here before, I doubt they’d have captured three. An astonishing picture! Thank you for sharing. Absolutely – at the time it could well have been the only photograph of three waterspouts in existence in the world, which would explain the international interest extending to the inclusion in the 1917 publication. One big question remaining for me is if the negative or high quality print has survived. If so then the Chatham Island Museum doesn’t have it, and it doesn’t appear to be in the Canterbury Museum either (although they are going to check another collection for me in April). Another possibility is that a decent copy of the photograph ended up in the hands of the Symon’s Meteorological Magazine and perhaps exists to this day in an archive in the UK. Will keep looking! I love the stories that lead from one curious thing to a whole interesting back story with lots of tendrils. It doesn’t always happen, but it’s great when it does. Yes it is fantastic when one things leads to another and then another! I had never heard of Cox before researching the story behind the photo and thoroughly enjoyed learning about his personal story, various scientific endeavors and military history. Almost sad to have to move on to a new story! Wonderful story; so well written. Really enjoyed it. Thanks! It was a lot of fun to research and write! Waterspouts, Chatham Islands AND Waterloo! An unlikely trilogy aye. I was surprised that so little had been written about Cox, (Shand is in the Dictionary of NZ Biographys). Hopefully there is increased interest in his work as I feel I’ve only scratched the surface. Will certainly make use of your ephemera in upcoming posts! The photos and history are absolutely amazing. Great work here. Thanks! I really enjoyed researching this particular story – it just kept getting better the further I looked into it. Whilst looking through my late Grandmother’s photos, we happened to stubble across this very photo printed onto a postcard. My Grandma was born on the Chathams 9 March 1910. Our picture doesn’t have the date on the front like your one pictured, so thinking it may have been an early print run, but it’s definitely the same photo. Do you have any idea how many were printed in each run? That is great that you’ve found one of these postcards! And very neat to have a family link. Unfortunately I don’t know how many were printed on each run, or how many runs there were. I’m also yet to find out if the original photo survives. Examples do show up from time to time on TradeMe and the card is in reasonable demand with collectors.